O/o Pr. 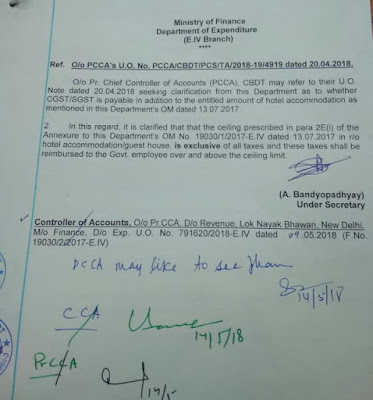 Chief Controller of Accounts (PCCA), CBDT may refer to their U.O. Note dated 20.04.2018 seeking clarification from this Department as to whether CGST/SGST is payable in addition to the entitled amount of hotel accommodation as mentioned in this Department’s OM dated 13.07.2017. 2. In this regard, it is clarified that the ceiling prescribed in para 2E(i) of the Annexure to this Department’s OM No. 19030/1/2017-E.IV dated 13.07.2017 in r/o hotel accommodation/guest house, is exclusive of all taxes and these taxes shall be reimbursed to the Govt. employee over and above the ceiling limit.